Generate strong passwords for your personal e-mail account or your instant messenger! 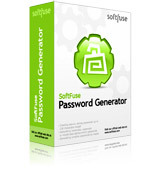 SoftFuse Password Generator Std generates strong passwords easily and quickly. Using this password generator, you can easily create extremely strong passwords up to 128-character length and lists including up to 100 unique passwords. While generating a password, you can use letters, digits, uppercase and lowercase characters and their combinations. SoftFuse Password Generator has many advanced features: using prefixes and suffixes, generating passwords by mask, password's expiration, password's hash generator, generating and saving password lists to files (txt, csv, rtf, xml, html), etc. With SoftFuse Password Generator, you can easily create strong and unique passwords for anything you need - for your e-mail account, for your instant messenger, for your computer system, for your accounts at web sites, etc. And you can rest assured they are strong and secure! SoftFuse Password Generator can be also easily used for generating random user IDs, phone numbers, PIN-codes, random lottery numbers, etc. To generate strong passwords each time you need to do it without thinking and with a single mouse click! To improve your informational security both on the Internet and at work. SoftFuse Password Generator Std is a program that can be used by regular users who care about their informational security both on the Internet and at work and by those who often create and use passwords. Rest assured that your correspondence, documents and other important information is protected even more securely than usually! If you find the software useful, please buy a license to get rid of all trial version limitations. The purchasing process is quick, easy and secure. You will get your product key within 24 hours (usually, in 1-3 hrs.) right after purchase. Remove all trial version limitations! Generate as many passwords as you wish! Special offers and discounts for other our products!